ALLEN PARK, Mich. (AP) — The Detroit Lions have allowed 16 sacks in the past two games — and this week isn’t off to a good start either for the offensive line. 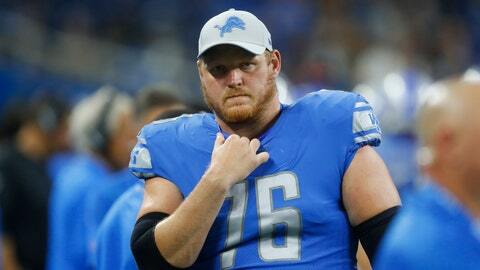 The Lions put guard T.J. Lang on injured reserve with a neck injury Wednesday. Lang has missed three games this season, including last weekend’s loss at Chicago. Detroit signed cornerback Mike Ford to the active roster from the practice squad and signed safety David Jones to the practice squad. The 31-year-old Lang is in his second season with the Lions after playing eight with Green Bay. Lang signed a three-year deal with Detroit before the 2017 season, returning to his home area. He was born in Royal Oak, went to high school in Bloomfield Hills and went to college at Eastern Michigan. Lang hasn’t played a full 16 games since the 2014 season, but he’s also never played fewer than 12 in his career. That obviously changes now. Lang has also dealt with back, concussion and hip problems this year. Guard Kenny Wiggins, who signed with the Lions in March, has started the three games that Lang missed so far this season. Detroit (3-6) has lost three straight. The Lions yielded 10 sacks against Minnesota two weekends ago and six against the Bears. The Lions have invested a lot in recent years to try to improve their offensive line. Detroit has used four of its past seven first-round draft picks on offensive linemen. Two of those selections — Taylor Decker and rookie Frank Ragnow — have started every game for the Lions this season. Lang, however, has been limited, and his future seems uncertain. Detroit’s running game has improved a bit, but the sack totals have stood out over the past two weeks. The Lions have fallen behind early, which makes it harder for them to take advantage of their running game. Quarterback Matthew Stafford has attempted 118 passes over the past three games.